Asha Singhal, sister of senior BJP leader of Delhi unit Harsh Vardhan, has been allegedly tricked into having several sleeping pills by her daughter-in-law Reena (28). And when she became unconscious, Reena dumped her outside a mortuary at AIIMS. The Allahabad High Court today dismissed a bunch of writ petitions challenging construction of a solid waste management project in Ghaziabad and slapped a cost of Rs 10 lakh each on two real estate firms for filing "vexatious litigations with ulterior motives". Two revenue officials of the Gurgaon district have been placed under suspension by the deputy commissioner for "concealing" facts in the partition of private land in Ullahawas village, a spokesman for the state government said here today. It was a hot and humid day in the national capital today, with no rain. The maximum temperature settled at 36.7 degrees Celsius, three notches above the average for this time of the year. Day two of the monsoon session of the Delhi Assembly today was again hit by a stormy start on the issue of the CAG report which has indicted the Delhi government for financial irregularities and favourism in the projects related to the Commonwealth Games (CWG). Putting to rest the speculation surrounding the controversial CD containing a conversation among former law minister Shanti Bhushan, Samajwadi Party (SP) chief Mulayam Singh Yadav and former SP leader Amar Singh, the Delhi police today filed a closure report stating that the CD was not doctored. Most slum dwellers in Delhi do not have access to household toilets and the community toilets are in a pathetic condition, a World Health Organisation (WHO)-supported study revealed today. Bahujan Samaj Party chief Mayawati, CPI(M) and Hotel Taj Palace figure in the New Delhi Municipal Council (NDMC) list of 6,816 individuals and institutions who have collectively defaulted on the payment of property tax to the tune of Rs 650 crore. What about Anna’s hospital bill? It was not clear today as to who would pay Anna Hazare's medical bill. The chairman of Gurgaon's Medanta Medicity hospital, where Hazare is recuperating after breaking his 12-day fast, Naresh Trehan, hinted that a decision on the charges would be taken later. The Supreme Court today asked private power distribution companies (discoms) in Delhi to furnish details of the number of connections provided by them and the total energy supplied to consumers. Consumers in Delhi restricting their monthly consumption of power to 200 units would get a subsidy of Re 1 per unit, Minister of State for Power Haroon Yusuf saidtoday, terming the step as "mitigation" for the recent power tariff hike. A plea seeking prosecution of Prime Minister Manmohan Singh in the cash-for-vote scam that rocked Parliament during a trust vote in 2008 was today dismissed by the Delhi High Court. Allegedly depressed over her husband's death, a 48- year-old woman hanged herself at her residence in the Mandawali police station area of east Delhi, today morning. According to the police, the deceased has been identified as Seema and lived in IP Extension. Two Noida boys, who were kidnapped last evening from the park in Sector 71, were today found lying unconscious in the Noida Extension area. The boys-Vipin (11) and Rishabh (12)-- were playing in the park when some persons allegedly fed them sedative-laced ladoos and took them away in a black Scorpio car. The students of municipal schools can now hope to drink clean and cold drinking water. The MCD today said it would provide better drinking water system in all its schools. The chairman, education committee of the MCD, Mahinder Nagpal, said they would install water coolers and reverse osmosis (RO) systems in its schools. As many as 200 faculty posts are lying vacant at the premier All India Institute of Medical Sciences (AIIMS) that serves an estimated 8,000 patients every day, health minister Ghulam Nabi Azad said today. Thereafter, Reena lodged a missing report about her mother-in-law, saying that she had left the house in an auto-rickshaw and was untraceable since then. According to the police, an incident was reported on August 24 and following the investigation, Reena was arrested yesterday. "Reena and her husband Parag reside at D-29, Anand Vihar, along with Asha. We have arrested Reena for drugging her mother-in-law with an intent to kill her and for fabricating the story of her sudden and mysterious disappearance," said Prabhakar, DCP (East). According to him, on August 27, it was reported by Reena that Asha had left the house on August 24 to visit her younger son Prateek Singhal, who stays in Paschim Vihar, but had not reached there. Even her mobile was switched off. "Contrary to Reena's report, local enquires revealed that Asha was seen being helped by Reena to get in a Wagon-R. A local tailor Naresh said he had indeed helped Reena in putting Asha in the car. To this, Reena had reported that Asha was not well and was being taken to hospital," said Prabhakar. During interrogation, Reena confessed to having drugged Asha with an intent to kill her and grab her property. She said Asha had recently sold a piece of property for a huge consideration and had received a part of the consideration which had been used to buy a residential accommodation at Vaishali in Ghaziabad. "It was also revealed that the transaction was to finally materialise on October 3 when the major part of the consideration would have been delivered to Asha. Reena thought that if her mother-in-law was put away, she would become the beneficiary of at least 50 per cent of the consideration and thus, could gain considerably," said Prabhakar. Reena procured sleep inducing drug, viz "Libotryp", on a prescription issued in her name from Shanti Mukund Hospital. She administered about 70 of these tablets to Asha and thereafter hired a Wagon-R. She took her around several hospitals but could not dump her unconscious mother-in-law because of the presence of a large number of people around the gates of these hospitals. Asha was finally dumped on a footpath in front of the mortuary at AIIMS. "The investigating team at the Anand Vihar police station thereafter reached AIIMS and found Asha admitted in an unconscious condition. She had been admitted by a security guard," said Prabhakar, adding that Reena was arrested soon after. Reena was married to Parag 11 years ago and has a daughter from the marriage. She hails from Ambala. Her husband is physically challenged and suffering from a weak eye-sight. Reena is a home-maker who takes western dance classes at home and organises events featuring western dances. The court also directed the companies to deposit Rs 1 crore each with the Ghaziabad Nagar Nigam towards the escalation of the cost of the project which had been delayed for "more than five years" on account of "filing of repeated writ petitions". The court, however, allowed petitions filed by residents of a village whose land was acquired last year following a proposed change in site for the project. It held that the acquisition was done "for ulterior purposes" and was "in colourable exercise of powers". 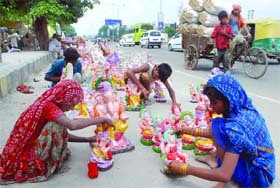 The order was passed by a division bench comprising Justice Sunil Ambawani and Justice Kashi Nath Pandey which directed leading petitioners Ansal Properties and Infrastructure Ltd (APIL) and Crossings Infrastructure Private Limited to deposit the amount, including the Rs 10 lakh cost, with the Ghaziabad Nagar Nigam "within one month from today". Both the companies were involved in developing residential complexes on land falling in village Dundehra, where the state government had decided to set up the Solid Waste Management Plant (SWMP) and had moved the court with the plea to set aside the order of the Special Secretary, State of UP, whereby the Ghaziabad Development Authority (GDA) was informed about the site chosen for the project. The court also imposed a cost of Rs 1 lakh on one Anil Kumar Tyagi, an employee of Crossing Infrastructure who had filed a petition "claiming to be a resident of village Dundehra", holding him guilty of "filing repeated frivolous petitions, stalling the environmental project of public importance to the citizens of Ghaziabad". Tyagi too had prayed for quashing the special secretary's 2008 order whereby the vice-chairman of the GDA was asked to invite objections and issue advertisements for holding public hearing with regard to the government's decision of changing "the land use of the selected site in village Dundehra" for the purpose of building an SWMP. Passing the order against Tyagi and the two companies, the court remarked that it found "necessary on the principles of restitution to neutralise the undeserved and unfair advantage gained by them by invoking the jurisdiction of the courts". Directing the companies to "bear the escalation of the cost of the project" ever since filing of petitions began in 2006, the court ordered that if the total cost escalation calculated by the Ghaziabad Nagar Nigam stood at "more than Rs two crore, the entire escalated cost, so determined, will be shared by M/s APIL and Crossing Infrastructure Private Limited". However, the court allowed petitions filed by Ram Bhul and others, whose 34.20 hectares of land in Galand village was acquired last year after the GDA proposed a change of site citing delay in the completion of the project on account of pendency of petitions challenging the same. The court was of the view that the acquisition of land was done "without specifying the acquiring body" and hence it appeared to be "in colourable exercise of powers" and "for ulterior purposes at the instances of the private builders". Gurgaon deputy commissioner PC Meena placed under suspension a patwari and a kanungo for allegedly concealing facts. Ullahawas village was in the news recently after the allotment of an over 5 acre to the Rajiv Gandhi Charitable Trust (RGCT) reached the Punjab and Haryana High Court following objections filed by people of the area. The trust that has high profile trustees like Sonia Gandhi and Rahul Gandhi wanted to set up an eye super-specialty hospital on the village land. "Chargesheets have been issued to both the officials under Rule 7 of the Haryana Civil Services Rules (Punishment and Appeals)," the spokesman said. "A case of partition of private land in revenue estate of village Ullahawas was filed in the court of assistant collector (tehsildar) of Sohna tehsil and at that time, the land was not under acquisition. But subsequently, notifications under Sections 4 and 6 of the Land Acquisition Act were issued and part of that private land also fell in the acquisition area," the spokesman said. The met office has predicted thundershowers in some parts of the city tomorrow. "Skies will remain partly cloudy with possibility of thundershowers on Wednesday," an official of the India Meteorological Department said. The minimum temperature today was recorded at 28.1 degrees, two notches above the average. The humidity registered a high of 85 per cent. BJP members have been demanding immediate discussion on the Comptroller and Auditor-General (CAG) report and the Shunglu Committee report on alleged irregularities in the CWG. But the ruling Congress opposed it and accused the BJP of obstructing the proceedings of the House. The opposition leaders had to be removed from the House by the Speaker after they created pandemonium and did not let the proceedings continue. They trooped into the Well while raising slogans, asking for a debate on the indictment of Chief Minister Sheila Dikshit for alleged irregularities in certain CWG projects. As soon as the House assembled at 2 pm, the BJP MLAs were on their feet, demanding Speaker Yoganand Shastri to allow a discussion on the CAG report. When he refused to take note of to their demands, the BJP legislators created chaos in the House and protested against the decision, forcing the Speaker to adjourn the House for 20 minutes. When the House reassembled, the BJP MLAs, wearing robes with slogans against the government on them, again disrupted the proceedings by trooping into the Well and demanding a discussion on the report. At this point, Shastri ordered that the BJP MLAs be removed from the House. Leader of the Opposition VK Malhotra termed the Speaker's action "undemocratic" and "unconstitutional". Yesterday, the House was adjourned after the BJP MLAs disrupted proceedings on the same issue. The BJP had earlier made it clear that it would specifically target Dikshit as the auditor had found her responsible for questionable decisions in various CWG projects. The session will have only five assemblies which will continue till September 5. The Delhi police was working to establish the authenticity of the CD in which Bhushan was speaking to the senior SP leaders on the lines of "fixing a judge" for a favourable judgement. "The CD has not been tampered with and we have filed a closure report in this regard," said a senior police official. The CD was circulated to all media offices in April this year after anti-corruption crusader Anna Hazare ended his fast demanding a strong Lokpal Bill. Bhushan, Hazare's close associate, was named co-chair of the joint committee formed to draft the Lokpal Bill and the circulation of the CD was seen by him as an attempt to tarnish his image. He had termed the CD as forged and lodged a complaint with the Delhi police under Section 469 of the IPC (forgery to hurt one's reputation). Mystery surrounded the CD after a lab in Delhi termed it 'not tampered with', while a Chandigarh-based CFSL called it 'tampered with'. According to Delhi police sources, a third opinion was taken from a Hyderbad-based lab and the Delhi police is going by its version that the CD has not been tampered with. Delhi Healthy Urban Project was conducted by the Sulabh International Academy of Environmental Sanitation and Public Health in east, west and south Delhi. Water supply and overall sanitation too were found to be major problems. "The slums have no water supply in most areas and there is no regular cleaning of toilets, drains and roads," Sulabh chairperson Suman Chahar said. "We propose to initiate the pilot project across the city for developing the localities into 'Healthy Settings' in the overall perspective of promoting Delhi as a 'Healthy City'," said Sulabh's director general AK Sengupta. According to the study, most of the drains in such areas were open and overflowed in rainy season, with solid waste management being a big problem. In addition, the residents threw their garbage in nearby parks, aggravating the problem. According to the list posted on its website today, the NDMC said 6,816 people and institutions have not made payments regarding property tax as on April 1 this year. The details in this regard were revealed in a recent RTI reply which was posted on the NDMC website. A senior NDMC official said the arrears were cumulative and did not pertain to any single year. The official said many of the cases were under dispute. According to the list, State Trading Corporation (STC) located in Tolstoy Building is the biggest defaulter owing Rs 43.60 crore followed by Hotel Taj Palace at Sardar Patel Marg (Rs 42.54 crore). The list said Mayawati, Chief Minister of Uttar Pradesh, owes Rs 31.76 lakh to the NDMC as property tax on her property on Sardar Patel Marg while the CPI(M), which owns a property on Bhai Veer Singh Marg, owes Rs 18 lakh to the agency. Some of the prominent hotels Maurya Sheraton (Rs 44 lakh) Samrat Hotel (Rs 20 crore), Hotel Janpath (Rs 6.9 crore) and Park (Rs 15 crore) are also on the list. Actress Sharmila Tagore owes Rs 8.81 lakh as property tax, according to the list. There are at least 40 defaulters who owe more than Rs 1 crore to the agency. "He is a decent man. I have immense respect for what he is doing. Let us first see the bills, only then something can be said," Trehan said. Hazare has been under the medical supervision of Trehan and has not been charged till now. India Against corruption (IAC) member Aswathi Muralidharan said, "Till now, he has not been charged. We can only say who will pay the bill if we get the bill." "Even when Trehan had seen him earlier, he was not charged," she added. An apex court bench of Justice D.K. Jain and Justice A.K. Ganguly issued the direction after court-appointed lawyer Ranjit Kumar said that the Delhi government's claim that there was surplus power in the city was hard to digest. The discoms were also asked to explain why they were supplying power to more than 1,400 unauthorised colonies and slums. The court directed the discoms to state the number of commercial connections they had given for the illumination of advertising hoardings and display panels at bus stops. The companies were also asked to indicate the percentage of total power being consumed by these commercial connections. The court's direction came during the hearing on a public suit related to Delhi's power situation. As Ranjit Kumar sought the court's direction to know the percentage of power loss on account of tapping or unmetered consumption, the court said the prevention of this was one reason for privatising power distribution in the capital. The judges were unconvinced when told that a number of hoardings in the city were solar powered. Justice Jain pointed out that he had not seen solar panels on any hoardings. The court was also told that there were just three hoardings in the New Delhi Municipal Council (NDMC) area which were powered by generators. The judges were told that all the hoardings in NDMC area were on railway land and the civic agency had no jurisdiction over them. 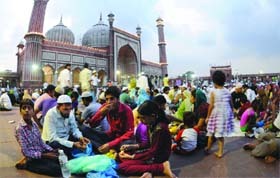 "The Delhi government has no role in determining the tariff order and the subsidy would be availed by two-thirds of Delhiites," said Yusuf. "In order to mitigate the effect of tariff hike, the subsidy has been announced. Of the 30,84,969 consumers, around 19,08,479 would be able to benefit from this scheme. The government will grant subsidy amounting to Rs 180 crore," he said. The minister said power tariff in the city was cheaper than other metro cities despite the surge in power demand from 3,097 MW in 2003 to 5,028 MW this year. "Seema was discovered hanging in her room. Although no suicide note was found, preliminary investigation has revealed that she was depressed over her husband's death in a road accident a few months ago. She was also suffering from an ailment and was undergoing treatment in a Noida hospital," said a police official. The victim worked as a head nurse at Hedgewar Hospital. Rakesh Kumar, the father of one of the victims, said, "Today, I got a call from a villager about the boys lying unconscious in the Noida Extension area. I went there and admitted my son and his friend to Shivalik Hospital,"
The boys told the police that the kidnappers took them in a black Scorpio car to a place. But there, a man told them that they were not the ones they wanted to kidnap. Then, they threw them in Noida Extension. They were unconscious the whole night." Shivalik Hospital doctors said the boys were admitted in a semi-conscious state. Rishabh had been discharged. Vipin studies in class V and Rishab in class VII in different schools. The project has started with the installation of water coolers in the municipal school at C-4, Janakpuri. "We are identifying the schools which do not have DJB water supply or where the ground water is not potable," said the chairman. The MCD was providing good quality thermos water bottles to the students of those schools where the DJB water is not available. In a written reply to the Rajya Sabha, Azad said of the 200 vacant posts, the institute had already advertised for 115 positions at the level of professors and lecturers in nursing. He also said that the institute's standing committee had considered all eligible faculties for promotion. Asked whether operation theatres at AIIMS were closed down, Azad said these were "temporarily closed for necessary maintenance and upgradation work". "So far as the neurology department is concerned, out of seven operation theatres, six are fully operational and one is being renovated," he added. The Delhi-based institute is among the top 10 medical colleges in the world, and serves mostly the underprivileged people who come from all over the country. The institute has over 2,200 beds.